Into the minds of the “Park Avenue” lawyers in the Goatherder Nation: Keep pumping Danny Abel’s letter writing campaign at the 5th Circuit boys! Moreover, the Webbs’ attorney, Daniel G. Abel, has repeatedly engaged in sanctionable conduct before this court. In Chisei v. Auto Club Family Ins. Co., 374 F. App’x 475, 477 (5th Cir. 2010), a panel of this court awarded sanctions against Mr. Abel’s client because Mr. Abel’s briefs were “wholly without merit,” “fail[ed] to fairly address the substance of the district court’s findings,” and “demonstrate[d] a pointed disrespect for ‘the limited resources of the judicial system.’” (quoting Stearman v. Comm’r, 436 F.3d 533, 540 (5th Cir. 2006)). In Martin v. Magee, No. 12-30263, 2012 WL 6644228, at *2 (5th Cir. Dec. 12, 2012), another panel of this court imposed $3,000 in sanctions against Mr. Abel, after finding that his briefing “indentifie[d] no legal error and raise[d] no significant, appealable issue.” Mr. Abel’s actions in this case continue what the Martin panel correctly described as “a continued pattern of filing frivolous, vexatious appeals that waste judicial resources.” Id. Because the instant appeal is frivolous, vexatious, and wastes judicial resources and because Mr. Abel has repeatedly abused the appellate process, we GRANT the motion for sanctions and impose sanctions against Mr. Abel in the amount of the reasonable attorneys’ fees and costs incurred by Morella in connection with this appeal. We REMAND to the district court for determination of reasonable fees and costs. Now for some lovely music. Author Douglas HandshoePosted on April 30, 2013 March 13, 2014 Categories SopTags Charles Leary, Daniel "Danny" Abel, Legal Department: Super 8 Motel, SLAPP Happy Nut Jobs, Trout Point Lodge, Trout Point Lodge Perret and Leary v Doug Handshoe, Vaughn Perret, Webb v Morella7 Comments on Into the minds of the “Park Avenue” lawyers in the Goatherder Nation: Keep pumping Danny Abel’s letter writing campaign at the 5th Circuit boys! Cause it’s out there folks. With the benefit of my prior experience covering an active Federal criminal investigation, the key is to figure out who is squealing and the most reliable source of that information is usually the squealer, as was the case with Tim Whitmer. Along those lines Sean Anthony has been reported in comments here as cooperating with the authorities. I’m not ready to call such at this point but my experience has been the business people truly know where all the “bones are buried” for it is they that are the puppet masters. I have some additional thoughts that, with a bit of luck, I’ll share later. We have renewed activity at the 5th Circuit! 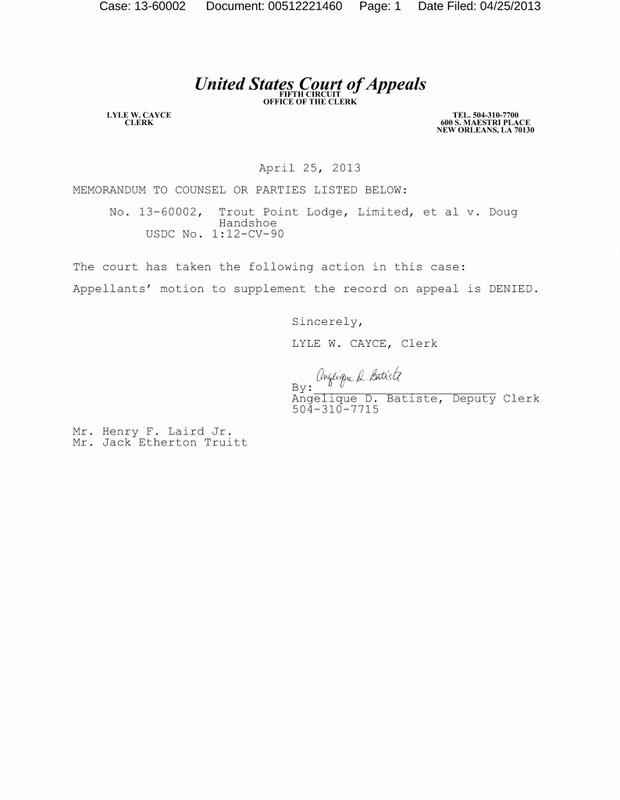 Author Douglas HandshoePosted on April 30, 2013 March 13, 2014 Categories SopTags Goatherders, SLAPP Happy Nut Jobs, Trout Point Lodge Perret and Leary v Doug Handshoe7 Comments on We have renewed activity at the 5th Circuit! There is one judge whom I get more complaints about than all the others put together……..
Click here to find his official webpage. I’m hearing fresh stories of legal jackassery that are simply astounding. Author Douglas HandshoePosted on April 29, 2013 March 13, 2014 Categories SopTags Judge Ross LaDart11 Comments on There is one judge whom I get more complaints about than all the others put together…….. Concocted evidence using false affidavits is their middle name……..
Weren’t the Goatherders blaming Hurricane Katrina in the ACOA litigation in Canada saying Danny Abel’s law office was in “New Orleans”? In that affidavit, filed by Plaintiff Sampson on 12/26/09 in this proceeding, Chris Yount swears that he served Mr. Whetstone through the City Attorney on April 14th, 2004. However, then Plaintiff Sampson’s Supplemental Memorandum admits on 12/31/2009, that this mistaken or false affidavit was a “mistake” attributable to Hurricane Katrina. No mention of the undisputed fact that Mr.Whetstone was not employed by the City at the time of the attempted service is made. The newly scanned Record Document Numbers 2 and 8 in 04-1052 show that Mr. Yount did not go to the City Attorney’s office on April 14th, 2004 as he swore on 12/26/2009 under penalty of perjury, but Mr. Abel went to the City Attorney’s Office instead, as he acknowledges in his 12/31/09 supplemental memorandum. (F). The Motion filed by attorney Daniel Abel in support of the Confirmation of Default on December 19th, 2006, ( Doc. # 36, Exhibit “1-C”), erroneously states that “the summons and citation were duly served on defendant MICHAELWHETSTONE on 11 February 2005″. This statement is not true, and it also conflicts with the date of service purportedly upon the City Attorney of April 14th, 2004, given by the other Affidavit filed by attorney Daniel Abel in support of the Preliminary Default on July 22, 2005 (Doc. # 18, Exhibit “1-B”). Thus, the two motions and affidavits filed in support of the confirmation of default are inconsistent with, and conflict with, each other. (G). The Affidavit filed by attorney Daniel Abel in support of the Confirmation of Default on December 19th, 2006, ( Doc. # 36, Exhibit “1-C”), erroneously states in Paragraph 2 that “Whetstone was an officer of the NOPD at all pertinent times hereto”. (I). On the original Complaint filed in 04-1052 (Doc. #1), an incorrect service address is listed for Mr. Whetstone. Author Douglas HandshoePosted on April 29, 2013 March 13, 2014 Categories SopTags Abuse of Process, Belo, Charles Leary, Chris Yount, Daniel "Danny" Abel, Eric Paulsen, Gates v Strain, Goatherders, Henry Laird, Jones Walker, Judge Louis Guirola, Legal Ethics, Malicious Prosecution, Mike Pearlstein, Pascal Calogero, Sampson v Whetstone, Shane Gates aka Shane D'Antoni, State of Louisiana v Desai, Vaughn Perret, WWL TV Channel 43 Comments on Concocted evidence using false affidavits is their middle name…….. They have perfected Kamikaze Goat repellent at the 5th Circuit! It appears Danny Abel’s letter writing campaign is over as the media department at Jones Walker strikes out on “expanding the record” with fantasy evidence. Author Douglas HandshoePosted on April 26, 2013 March 13, 2014 Categories SopTags Charles Leary, Daniel "Danny" Abel, Goatherders, Henry Laird, Jones Walker, SLAPP Happy Nut Jobs, Trout Point Lodge, Trout Point Lodge Leary & Perret v Doug Handshoe & Anne Marie Vandenweghe, Vaughn Perret5 Comments on They have perfected Kamikaze Goat repellent at the 5th Circuit! It was Whitmer and Wilkinson, along with Dominick Fazzio that hammered out the parish contract with the River Birch Landfill. Under Broussard, who was largely a hands-off executive, Whitmer ran the 3,100-employee, $500 million administration. He possessed an encyclopedic knowledge of projects and programs and was renowned for answering emails deep into the night, after ramrodding meetings and extinguishing political fires all day. This is absolutely true. Broussard was always off running scams for his own self enrichment while Tim Whitmer was the defacto Parish Prez under two administrations. To the underlings at Yenni, Whitmer was seen as a ruthless snake in the grass that terrorized the minion. In certain circles he is as hated as Tom Wilkinson as both used blunt force trauma as their preferred management style. Unlike Wilkinson, who is crass and vulgar, Whitmer had the Cleaver family playground spiel perfected. Both are now convicted felons. In other news my Truitt Law Firm Mug arrived in the mail today and it is a keeper! Thanks Bobby. Two words Bill: Video Depositions, preferably posted to Youtube. My money is on Magee putting Eric “The Toolman” Paulsen himself to the question in order to examine his state of mind when Channel 4 was pumping Danny Abel’s crash and burn racketeering lawsuit against Magee on behalf of the Martin family. Meantime in other news by my count there are at least 5 complaints filed against Danny Abel with the Louisiana ODC including the one filed by Louisiana 22nd JDC Chief Judge William J Knight. Meantime from the cause and effect files I’ve been notified the Mississippi wing of the Goatherder Nation has sent in more Kamikaze Goats as I’ve received this dispatch from the fabled Slabbed Legal Team on the latest activity at the 5th Circuit Court of Appeals. Jim Brown’s Weekly Column: The Bomber, Miranda and the Constitution! THE BOMBER, MIRANDA AND THE CONSTITUTION! Constitutional rights for the Boston bomber? Are you kidding? For days we watched the video footage of Dzhokhar Tsarnaev walking the streets of Boston with a backpack loaded with a homemade bomb. A growing list of circumstantial evidence points to his guilt. Yes, he is a naturalized American citizen, but we watched this drama unfold on TV and he seems to be about as guilty as you can get. So why does this heinous accused murderer deserve any rights at all? Polls taken by local media across the country show that the public considers the bomber to be a terrorist. South Carolina Senator Lindsey Graham summed up the prevailing view in a tweet: “The Law of War allows us to hold an individual in this scenario as an enemy combatant without Miranda warnings or appointment of counsel. The last thing we may want to do is to read Boston suspect Miranda Rights.” So the question is: Does the constitution protect the rights of every American citizen in the United States? First of all, were these two brothers enemy combatants or terrorists? There is no evidence so far that they received either encouragement or specific help from any outside source. They were apparently religious fanatics, but is that enough to call this a terrorist attack? If these two distorted and warped young men are to be labeled terrorists or enemy combatants as Senators Graham and McCain have suggested, then what’s the difference between what they did and what happened in Tucson, Columbine, Aurora and Sandy Hook? At the Sandy Hook elementary school, 26 people were shot and killed including 20 children. Was the shooter, Adam Lanza a terrorist? At a movie theater in Aurora, Colorado, 70 people were shot and 12 died. And how about the Tucson shooting by Jared Loughner, where 19 people were shot including Congresswoman Gabrielle Giffords, and where 6 were killed? Ten years ago two teenagers killed 12 students, a teacher, and themselves at suburban Denver’s Columbine High School. As horrendous as these killings were — were any of them really acts of terrorism? Continue Reading…………………….. Author Douglas HandshoePosted on April 25, 2013 March 13, 2014 Categories Jim BrownTags Jim Brown1 Comment on Jim Brown’s Weekly Column: The Bomber, Miranda and the Constitution!